Define and save detailed custom weather conditions, enable real-time weather, set ILS visibility for all categories and set season, time and simulation rate. 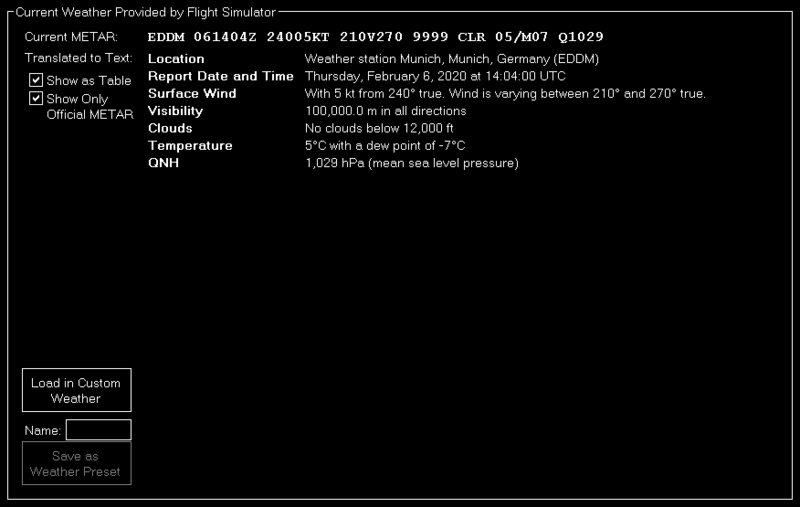 In this section the current weather is displayed as METAR code and translated text. You can choose if the translated text it displayed as continuous text or structured table. 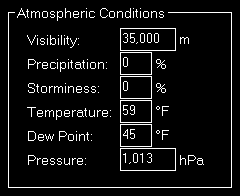 Additionally you can decide if all or only official weather METAR data is displayed. 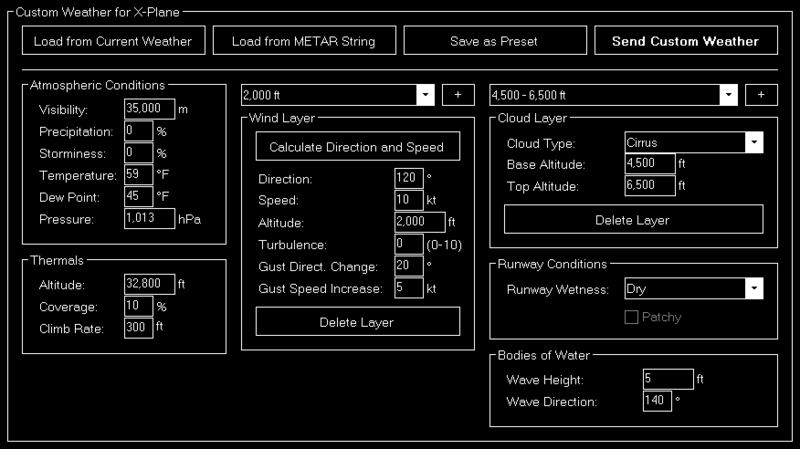 Note: The flight simulator uses the official METAR format, but extends is with additional extensions. FS-FlightControl can decode both, the official METAR data as well as the flight simulator extensions. You can load the current weather into the custom weather section or save it as weather presets. 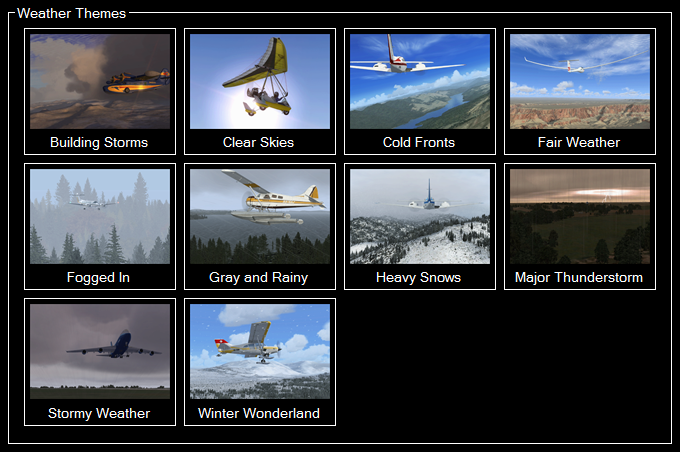 Here all themes that are available in the flight simulator are listed and can be activated with just one click. Note: This section does not appear if Active Sky is enabled as weather engine in the Settings module. In this area you can see the current Active Sky weather mode and change it, too. Note: This section only appears if Active Sky is enabled as weather engine in the Settings module. Select the desired weather mode here and set it with the button Set Weather Mode. 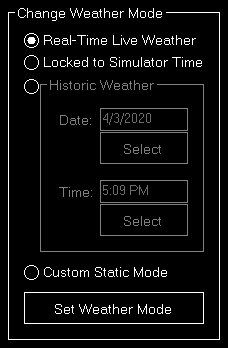 If you have chosen the hisotoric dynamic weather mode you can set the historic date and time here. You have the option to enable real-time weather in this section. 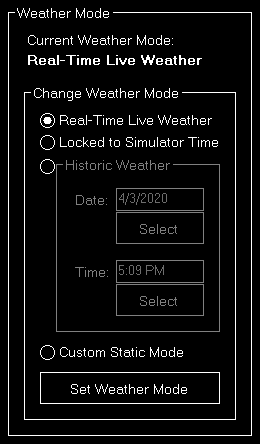 Therefore you can either send the current real-time weather directly to flight simulator or load it into the custom weather section. 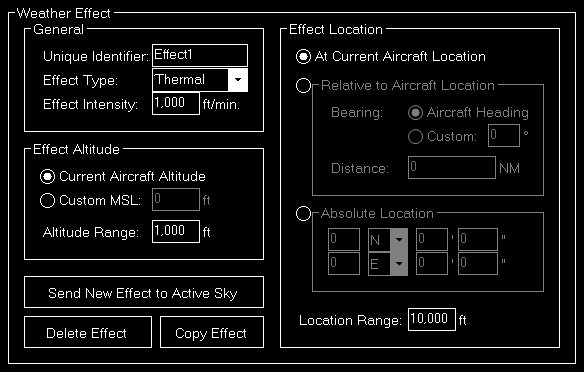 Note: This section does only appear if Prepar3D, FSX or FSW is selected as simulator type and Active Sky is not enabled as weather engine in the Settings module. Additionally you will see the current availability status of the real-time weather and you have the option to use the button Refresh Real-Time Weather Now to reload the weather at any time. Note: This section does only appear if X-Plane is selected as simulator type. To enable continues real-time weather just activate the corresponding check box. This will enable automated real-time weather updates for all weather stations around the current aircraft location. You can choose how often this weather update should be performed by entering a certain time interval or a flown distance (or both). Additionally you can define that automated weather updates should not be performed when the aircraft is below a certain altitude above ground. This makes sure that the pilot is not disturbed while doing a final approach. Below that some information is displayed to show when the next automated weather update will be performed. 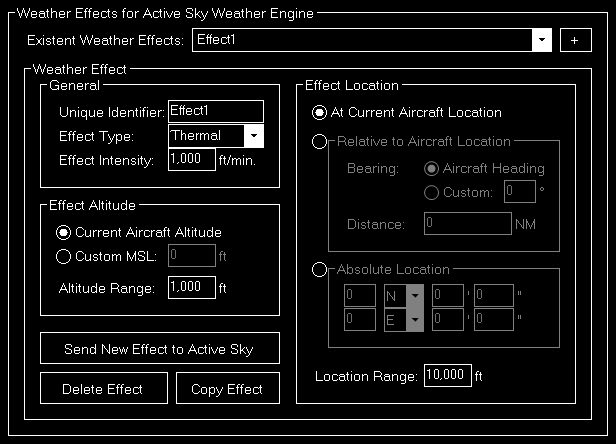 In this area you can create new and edit existent Active Sky weather effects. Here different options of the weather effect can be changed. Use the button Send New Effect to Active Sky to active a new weather effect, the button Delete Effect to remove an existent one again and Copy Effect to create a duplicate of the current selected effect. Note: An already sent weather effect cannot be changed anymore. Please just duplicate it and then remove the old one. Then the effect intensity can be defined as vertical speed for thermal, downdraft and updraft effect types and as an intensity between 1 and 5 for the turbulence and windshear effect types. 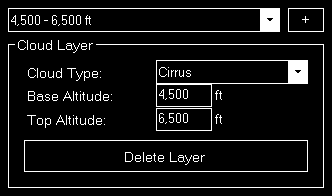 You can choose here if the current aircraft altitude should be used for the effect or you want to define an altitude (MSL) manually. Additionally an altitude range can be set: So if you define, for example, an custom altitude of 10,000 ft and an altitude range of 1,000 ft the effect will be active between 9,500 and 10,500 ft. 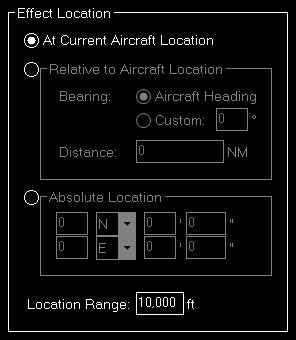 Select here if the effect should be placed at the current aircraft location, relative to the aircraft location or at a custom absolute location. Additionally a location range can be set defining the radius around the location where the effect should be active. If the effect should be placed relative to the aircraft location, you first need to choose if it should be place in the direction of the current aircraft bearing or in a custom direction. Then you need to define the distance the effect should be placed away from the aircraft. In case of an absolute position you can directly enter the latitude and longitude of the position where the weather effect should be located. 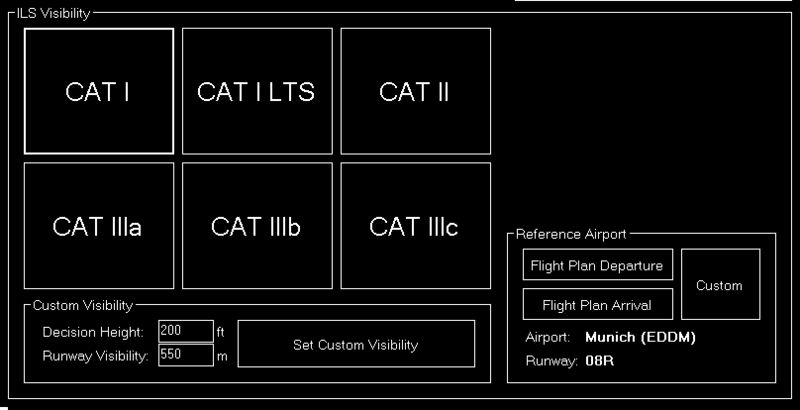 Use this section to set a pre-defined visibility condition for any of the ILS categories. Note: You can customize these values in the Settings module to your needs. In case you want to define a completely custom weather situation you can do so in this section. 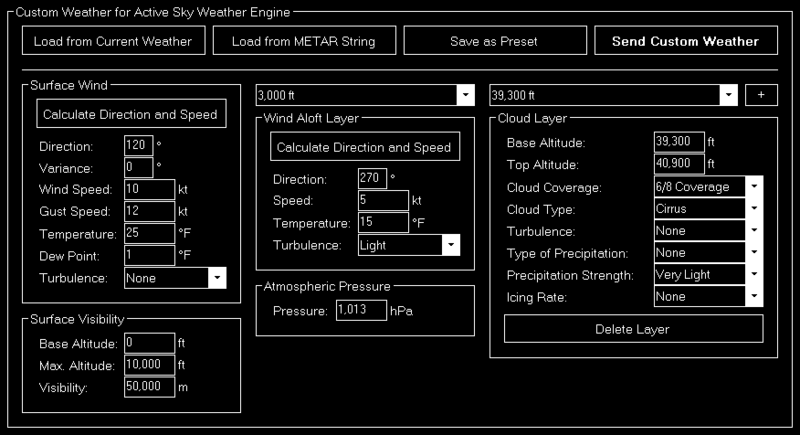 Note: This version of the custom weather section appears if Prepar3D, FSX or FSW is selected as simulator type. If you have a METAR string as starting point for your custom weather enter it in the corresponding text field on top of the screen and click on the Load button. This will decode the weather situation defined in the METAR string into the custom weather sections below. To send the weather define in these custom weather sections to the flight simulator, just click on the Send Weather button. 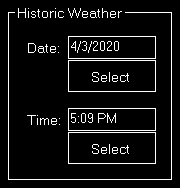 You may also save your custom weather situation as weather presets. Just enter a name and then click on the Add Preset button. You can define all wind layers - including the surface wind - in this section. You can define it as Entirely Variable or even enter the from and to direction where the wind is coming from. If the wind should come only from a fixed direction, just keep the Entirely Variable Direction check box unchecked and the variation input fields as 0. 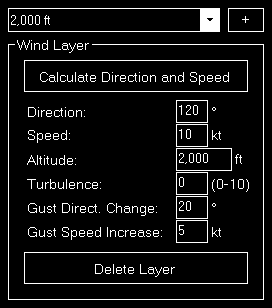 Next enter the speed and optional gust speed (keep it 0 if not needed) of the wind layer. Next you can define if the current wind layer is a surface wind or an wind aloft. 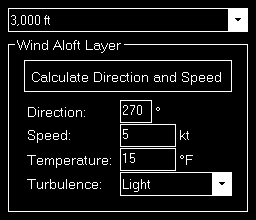 In case of a surface wind you have the additional option to define a depth/height of the wind and if it is a wind aloft you can define a maximum altitude (MSL) for it instead. Note: You may add as many wind layers as you want, but there can be only one of them defined as surface wind. Here you can define all cloud layers of the custom weather situation. First enter a base altitude (MSL) for the cloud layer. The visibility layers of the custom weather situation can be defined in this section. First enter the base and maximum (top) altitude (MSL) of the visibility layer. Then you can define the visibility in this layer itself. Note: To set the same visibility for more than one direction, but not for all, just create another visibility layer with the same base and maximum altitude. Also individual temperature layers can be defined for your custom weather situation. First enter the maximum altitude (MSL) up to which this layer should be valid. Then you can enter the temperature and dew point of this temperature layer. Here you can define the atmospheric pressure for your custom weather situation. 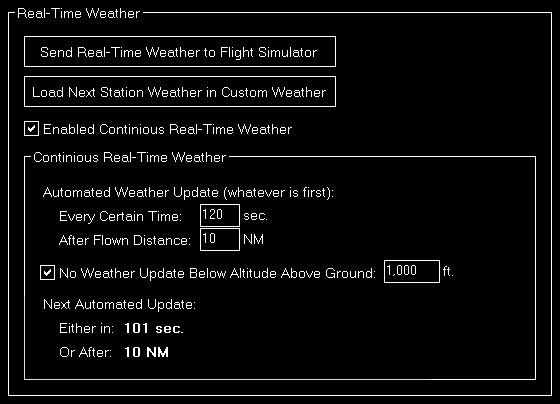 Note: This version of the custom weather section appears if X-Plane is selected as simulator type. Here you can first define the visibility followed by the precipitation and storminess as percentage. Additionally the temperature, dew point and atmospheric pressure can be set. You can define thermal effects in this section. First enter the altitude where the thermal effect should occur. Then you can set its coverage as percentage as well as the climb rate. You can define all wind layers in this section. First enter the direction, altitude and speed of the wind layer. Next you can define the turbulence intensity between 0 and 10. Finally the gust direction change and speed increase can be set. In this section the water wave height and direction can be defined. 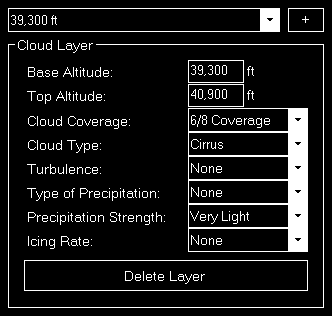 Then you can enter a base and top altitude (MSL) for the cloud layer. If you have chosen Damp or Wet you can additionally decide if the runway surface should be patchy or not. Note: This version of the custom weather section only appears if Active Sky is enabled as weather engine in the Settings module. 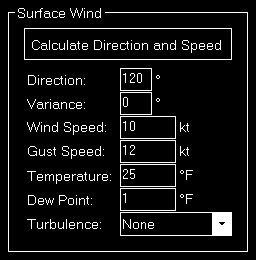 You can define the surface wind in this section. First you can define the direction where the wind is coming from including a variance. Next enter the speed and optional gust speed (keep it 0 if not needed) of the wind. Also the temperature and the dew point on the surface can be defined here. The surface visibility of the custom weather situation can be defined in this section. Then you can define the visibility itself. You can define all wind aloft layers in this section. First enter the direction and speed of the wind layer. Note: The altitudes of the individual wind layers cannot be changed for Active Sky. First enter a base and top altitude (MSL) for the cloud layer. 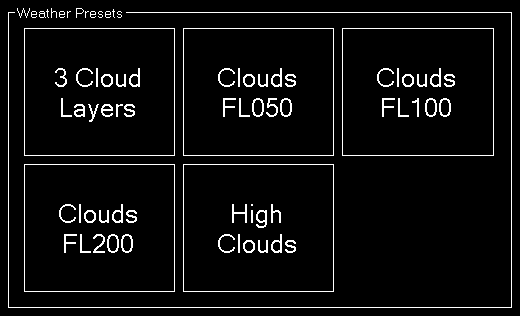 All your saved weather presets are listed here. There is no limit in the number of weather presets you can define. If you right click (long “touch”) on a weather preset this pop-up menu will be shown enabling you to rename, delete or edit an existent weather preset again. 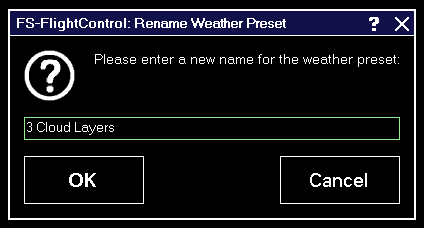 Here you can set a new name for an existent weather preset. In this section you have a quick and easy control of the current season. Just click on one of the pre-defined season buttons. Additionally you can define a completely custom date and time in this section. Beside a very detailed weather configuration system this module offers here also an easy way to change the current simulation rate of the simulator. Only for X-Plane additionally the actual simulation rate is shown next to the currently requested one. For Prepar3D, FSX and FSW these two are always identical. Additionally in the bottom right of the screen you always have an eye on the current frame rate and simulator time.